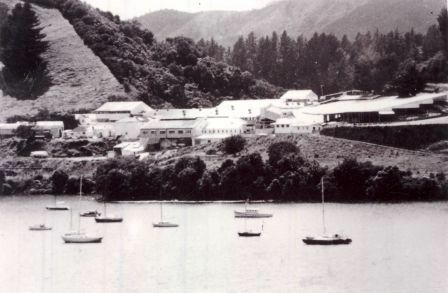 Although there is no record of Maori settlement in the bay, the original name, Kaipupu, (eating shellfish) shows that it was a well-known food gathering place. The English name was bestowed by early surveyors, even before Picton was named. 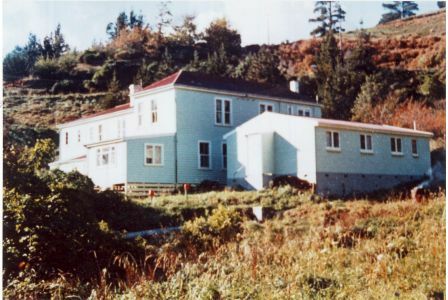 The bay was settled by Pakeha fairly early - Edward and Mary Ann Clemens moved there in 1861 and raised a family of 14 children. Edward was related to the American author Mark Twain, whose real name was Samuel Clemens. Edward Clemens prospected for coal without success and turned to farming. Freezing works, Kaipupu. Picton Historical Society. 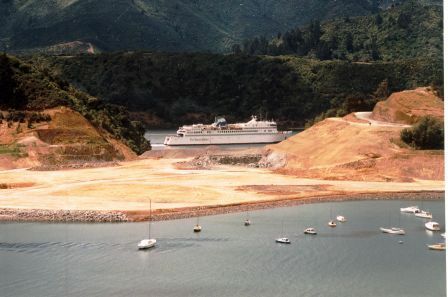 Logging port development, Shakespeare Bay. Picton Historical Society. Edward and Maryann Clemens were my Great Grandparents. Our research on the family tree has never managed to confirm any relationship to Mark Twain (Samuel Clemens). I would love to hear if anyone has ever been able to come up with a positive connection. how do we contact kaipupu point? Ed. the website for the sanctuary is: http://www.kaipupupoint.co.nz/. There is a contact us form on the site. i spent a lot of time fishing in the bay heaviest fish was a 56lb kingfish caught after 3 hours . Marlborough freezing works (1899, August 4). Marlborough Express, p. 4.